Existential therapy is a humanistic therapy which is centred on the philosophy of existentialism or the nature of human existence. Its origins lie in the 1800’s in the work of some of the early philosophers such Soren Kierkegaard and Friedrich Nietzsche. Kierkegaard proposed that that human discontent could only be overcome through internal wisdom and Nietzsche later emphasised the importance of free will and personal responsibility. They were revolting against a tradition of looking for order and structure in the world and proposed instead that it is up to each of us as humans to find meaning for ourselves in what is largely a meaningless universe and also to take responsibility for and embrace our existence through exercising our own free will and choice. These raise very large questions for each of us and confronting them or not can give rise to dread or anxiety and this is often referred to as existential anxiety. Much of the work of existential psychotherapy is about achieving a balance between confronting these human givens in a way that acknowledges them but without being overwhelmed by them. At the same time we must use them to take full responsibility for our own lives and to live as rich and meaningful life as is possible. We must face the fact that we are fundamentally alone in the world. This can be a challenging concept for many and also there is a paradox as we long for connection with others and come to know ourselves through our relationship with others. Contentment comes for understanding our lives. This is in the context of the bigger picture and against the backdrop of the ‘human givens’ of existence. Finding meaning and purpose in our lives is essential to our wellbeing. This can be found in every situation we may find ourselves during our lives including during difficult times and there can be meaning for us in some of the most ordinary and everyday tasks. Anxiety arises when we are faced with the ‘givens’ of existence. These are part of the nature of our human existence. Acceptance, freedom of choice and taking responsibility are key to our wellbeing. We must understand the connection between the life we are living and the choices we have made and exercise our free will to make good choices for the future. 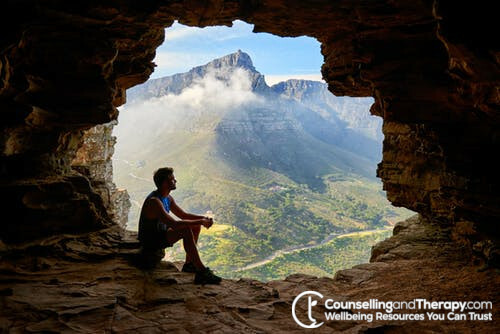 While existential therapy may have it roots in philosophy, its themes can be applied to our everyday lives to help us live more fully and in a richer and more engaged way and thus bring many benefits to our wellbeing.